Public art installations can be cool. Adding in audience interactivity bumps up the coolness factor a bit. Throw civic pride, dancing jets of water, music, and lights into the project, and you get this very cool pressure washer powered musical fountain. The exhibit that [Niklas Roy] came up with is called Wasserorgel, or “water organ”, an apt name for the creation. Built as part of a celebration of industry in Germany, the display was built in the small town of Winnenden, home to Kärcher, a cleaning equipment company best known for their line of pressure washers in the distinctive yellow cases. Eight of the company’s electric pressure washers were featured in the Wasserorgel, which shot streams of water and played notes in response to passersby tickling the sturdy and waterproof 3D-printed keyboard. The show was managed by an Arduino with a MIDI shield, which controlled the pressure washers via solid state relays and even accepted input from an anemometer to shut down the show if it got too windy, lest the nearby [Frau Dimitrakudi] be dampened. The video below shows how engaging the Wasserorgel was during its weeks-long run in the town market square; there’s also one in German with build details. And while we can’t recall seeing pressure washers in public art before, we do remember one being used as the basis of a DIY water-jet cutter. [pepelepoisson]’s Miroir Magique (“Magic Mirror”) is an interesting take on the smart mirror concept; it’s intended to be a playful, interactive learning tool for kids who are at an age where language and interactivity are deeply interesting to them, but whose ceaseless demands for examples of spelling and writing can be equally exhausting. Inspiration came from his own five-year-old, who can neither read nor write but nevertheless has a bottomless fascination with the writing and spelling of words, phrases, and numbers. The magic is all in the simple interface. 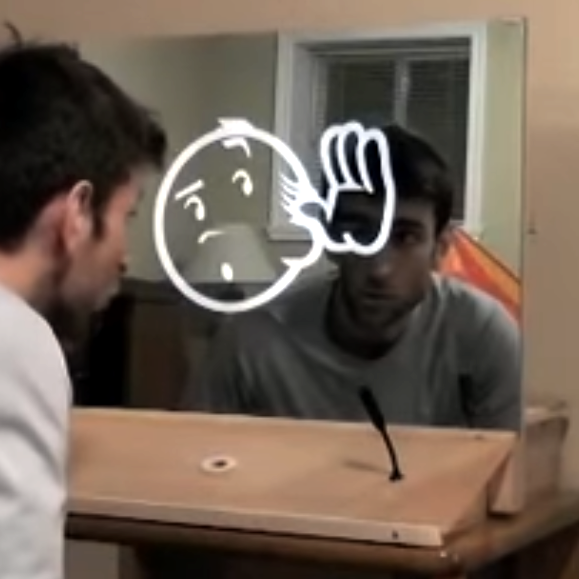 Magic Mirror waits for activation (a simple pass of the hand over a sensor) then shows that it is listening. Anything it hears, it then displays on the screen and reads back to the user. From an application perspective it’s fairly simple, but what’s interesting is the use of speech-to-text and text-to-speech functions not as a means to an end, but as an end in themselves. A mirror in more ways than one, it listens and repeats back, while writing out what it hears at the same time. For its intended audience of curious children fascinated by the written and spoken aspects of language, it’s part interactive toy and part learning tool. Like most smart mirror projects the technological elements are all hidden; the screen is behind a one-way mirror, speakers are out of sight, and the only inputs are a gesture sensor and a microphone embedded into the frame. Thus equipped, the mirror can tirelessly humor even the most demanding of curious children. [pepelepoisson] explains some of the technical aspects on the project page (English translation link here) and all the code and build details are available (in French) on the project’s GitHub repository. Embedded below is a demonstration of the Magic Mirror, first in French then switching to English. Digital color theory can be a tricky concept to wrap one’s mind around – particularly if you don’t have experience with digital art. The RGB color model is about as straightforward as digital color mixing gets: you simply set the intensity of red, green, and blue individually. The result is the mixing of the three colors, based on their individual intensity and the combined wavelength of all three. However, this still isn’t nearly as intuitive as mixing paint together like you did in elementary school. To make RGB color theory more tangible, [Tore Knudsen and Justin Daneman] set out to build a system for mixing digital colors in a way that reflects physical paint mixing. Their creation uses three water-filled containers (one each for red, green, and blue) to adjust the color on the screen. The intensity of each color is increased by pouring more water into the corresponding container, and decreased by removing water with a syringe. An Arduino is used to detect the water levels, and controls what the user sees on the screen. In one mode, the user can experiment with how the color levels affect the way a picture looks. The game mode is even more interesting, with the goal being to mix colors to match a randomly chosen color that is displayed on the screen. The practical applications for this project may be somewhat limited, but as an interactive art piece it’s hypnotizing. And, it may just help you with understanding RGB colors for your next project. When you already know exactly where and how you’d like your motor to behave, a code-compile-flash-run-debug cycle can work just fine. But if you want to play around with a stepper motor, there’s nothing like a live interface. [BrendaEM]’s RDL is a generic stepper motor driver environment that you can flash into an Arduino. RDL talks to your computer or cell phone over serial, and can command a stepper-driver IC to move the motor in three modes: rotary, divisions of a circle, and linear. (Hence the acronumical name.) Best of all, the entire system is interactive. Have a peek at the video below. The software has quite a range of capabilities. Typing “?” gets you a list of commands, typing “@” tells you where the motor thinks it is, and “h” moves the motor back to its home position. Rotating by turns, degrees, or to a particular position are simple. It can also read from an analog joystick, which will control the rotation speed forward and backward in real time. Division mode carves the pie up into a number of slices, and the motor spins to these particular locations. Twelve, or sixty, divisions gives you a clock, for instance. Acceleration and deceleration profiles are built in, but tweakable. You can change microstepping on the fly, and tweak many parameters of the drive, and then save all of the results to EEPROM. If you’re playing around with a new motor, and don’t know how quickly it can accelerate, or what speeds it’s capable of, nothing beats playing around with it interactively. There’s nothing better than making a giant version of one of your hacks. That is, other than making it giant and interactive. That’s just what [Est] has done with his interactive VU meter that lights up the party. The giant VU meter boasts a series of IR detectors that change the colors and modes of the meter based on where the user places their hands. The sensors measure how much light is reflected back to them, which essentially function as a cheap range finder. The normal operation of the meter and the new interactivity is controlled by a PIC16F883 and all of the parts were built using a home-made CNC router. There are two addressable RGB LEDs for each level and in the base there are four 3 W RGB LEDS. At 25 levels, this is an impressive amount of light. [Est]’s smaller version of the VU meter has been featured here before, if you’re looking to enhance your music-listening or party-going experiences with something a little less intimidating. We’ve also seen VU meters built directly into the speakers and also into prom dresses. Storytelling is an art. It stretches back to the dawn of man. It engages people on an emotional level and engages their mind. Paulina Greta Stefanovic, a user experience researcher and interaction designer is on the cutting edge of bringing our technology together with the best human aspects of this long tradition. The information age is threatening storytelling — not making it extinct, but reducing the number of people who themselves are storytellers. We are no longer reliant on people in our close social circles to be exquisite story tellers for our own enjoyment; we have the luxury (perhaps curse?) of mass market story-telling. Paulina’s work unlocks interactive storytelling. The idea isn’t new, as great storytellers have always read their audience and played to their engagement. Interactive storytelling in the digital age seeks to design this skill into the technology that is delivering the story. This is a return from passive entertainment. This breaks down into interactive versus responsive. At its simplest, think of responsive as a video that has a pause button. You can change the flow of the story but you can’t make the story your own. Surprisingly, this is a new development as the ability to pause playback is but a few decades old. So you can pause a responsive medium, but true interactive experiences involve creation — the audience is immersed in the story and can make substantive changes to the outcome during the experience. This equates to a power transfer. The creator of the media is no longer in complete control, ceding some to the audience. We are just at the start of this technology and it looks like the sky is the limit on what we can do with algorithmic interactions. Video games are the forerunners of this change. They already have branching stories that let the users make choices that greatly affect the storyline. This industry is huge and it seems obvious that this active aspect of story consumption is a big part of that success. Even more intriguing is a “drama management system” (a new term to me but I love it) that results in a story whose ending nobody knows until this particular audience gets there. What a concept, and something I can’t wait to see for myself! If you find these concepts as interesting as I do, check out Paulina’s talk below, which she presented at the Hackaday Belgrade conference.